Fire horse 1 was raised on the farm where she was born. Her handling has been consistent and gentle. She has been taught to yield to her halter rope, lead, pick up all her feet and load in the trailer. She is now a coming 3 year old and ready to go into training as a show horse. Fire horse 1’s owner has selected a trainer that is local and well respected for his care and success with young horses. Fire horse 1 has been on a ration of 2# a day of a 14% extruded horse feed and grass hay. The bagged feed portion of her diet is cut back when pasture is available and of high quality. A prebiotic/blue green algae supplement has been fed to her to provide extra vitamins and trace minerals. She has access to free choice loose white salt. In anticipation of heavier work and some anxiety from the training, Fire horse 1’s owner has started adding 1/2 flake of alfalfa twice a day for added nutrition and to help prevent ulcers. On the day of the move to the trainer Fire horse 1 is started on her Fire horse balancing formula at 1 scoop a day. After she settles in with her new situation she will be kept on the balance formula at 1/2 scoop a day. Fire horse 1 is moved to the trainer’s and understandably shows some anxiety when she is put in a stall in a barn she is not familiar with. Her anxiety begins to decrease when her hay is put in and she gets a small bit of grain containing her usual feed and supplements. Fire horse 1 responds beautifully to her new trainer. She is willing to please and gets lots of praise for any effort she shows. Her only problem is her tendency to get to fast is her gaits and her trainer has to do lots of transitions to keep her balanced. 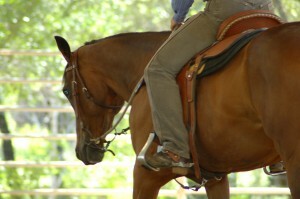 Backing also helps Fire horse 1 build up her posture muscles so she is less likely to get sore in her stifles. After only 90 days of training Fire horse 1 goes to her first show and enjoys herself. She even brings home a ribbon. She goes on to have a very successful show career. Fire horse 2 is born on a breeding farm with many broodmares. She is handled very little and haltering and feet trimming is always an ordeal. She is sold as a 2 year old and her first trailer loading experience happens when her new owner comes to get her. Ropes and whips are used to force her into the trailer. Once inside she panics and falls down under the partition. Luckily she is only scraped up but her fear of trailers is set and she never loads or hauls easily from that time on. Fire horse 2 arrives at the new farm and is put in a stall with some grass hay and a pelleted horse feed. The feed and hay are very different from what she had been on and her stomach is very upset from the stress of trailering. She refuses to eat and after a few hours of pacing her stall she starts to have colic symptoms. Her colic is treated with drugs and the vet puts her on a very expensive ulcer medication. The medication helps with her stomach pain and she eventually eats the new feed and hay. Training starts a few days later and although Fire horse 2 is scared she does her best and gets through the saddling and first few rides. She struggles with her balance and tends to get fast in her gaits. The trainer decides she has too much energy and decides to work her until she gets tired enough to go slow. Exhaustion, sore muscles and joints start to take their toll on young Fire horse 2. Despite her ulcer medication she does not want to finish her feed and her condition suffers. Her owners decide she does not have any potential as a show horse and she is too difficult to deal with so they decide to sell her. Luckily the owners of Fire horse 1 buy her and put her on a natural product to help heal her ulcers, feed her based on her Fire temperament type and restart her in with a trainer who understands how to work with her. After a few months Fire horse 2 has gained weight, responded to training and is starting to go to a few shows. Unfortunately, her fear of trailers is still part of her life. Registration fee is $45.00 per person and you can register or see more info at www.montanahorsesanctuary.org/workshops.html. This entry was posted in Five Element Personality Typing, Newsletters and tagged holistic horse care, holistic horse health, horse, horse temperament, horses on March 15, 2017 by Madalyn Ward, DVM.